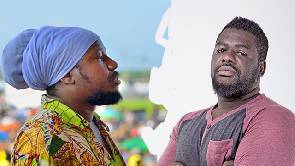 Lawrence Nana Asiamah Hanson known widely as Bulldog has fired at Reggae act Blakk Rasta after Blakk faced Parliament’s Privileges Committee over alleged comments he made claiming that over 80% of Members of Parliament smoke Maurijuana (wee). I never knew you could be remorseful. Blakk Rasta next time learn to respect your elders… You have brought disgrace to your parents, I am very sure you got proper upbringing but you paid no heed. Open your mouth that wide again and you will face the full rigors of the law. You sit on your show maligning and make a mockery of personalities the least opportunity you get. I don't blame you but the people who put you on radio. For a firm like multimedia that has produced the finest of presenters and journalists in the broadcasting industry this mars it's reputation. I wonder if anyone supervises Blakk Rasta's show? Or maybe HITZ FM doesn't have a programs manager. OH SORRY! Okraku Mante is. Okraku Mante put a padlock on Blakk Rasta's slanderous lips, that's your job as a manager, to put your staff in check and stop hopping from one station to the other professing doom for ghanaian artistes. Always claiming Shatta Wale is disrespectful, Sarkodie is arrogant and countless belittling remarks you make about ghanaian artistes and their managers. Or you are also an "Errand Boy" and not a programs manager? Clean your house first. This serves as a deterrent to all radio presenters and pundits who lack intelligence and common sense that mount platforms to insult the president and government officials. If you have a different view on how the country should be run, you don't insult your elders. There are intelligent and respectful ways of going about it. I dedicate Shatta Wale's "Stinking Mouth" to you Blakk Rasta, hence forth play it on your show everyday to remind you to SHUT UP.